Polytron Technologies, Inc announced to launch its LED glass with printed image this week. 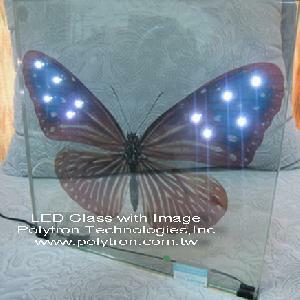 It is a special designed LED glass wall lamp, with a butterfly printed on an interlayer between two sheets of glass where decorated LEDs are mounted on the fleck of the butterfly wings. When the LED light is off, it appears as a beautiful butterfly embedded in the glass. The printing quality is high pixel and the image is vivid. When the LED is on, it turns into a spectacular light decoration on the wings of the butterfly. The appearance is fantastic. Polytron Technologies, Inc. supplies OEM or ODM service for this type of LED glass applicable for final products, such as wall lamp, decorating lamps, special designed awards, creative gifts, company logos, public signs, high-end design clocks, glass paintings. It can combine with high definition photos or images in the glass, decorated with LEDs to enhance stylish designs. More ideas and applications shall come from your designs and imagination.